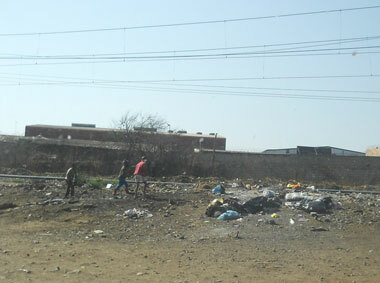 Next to Freedom Charter Square, Kliptown, Soweto, people still live in squatter camp squalor. So much for Freedom. 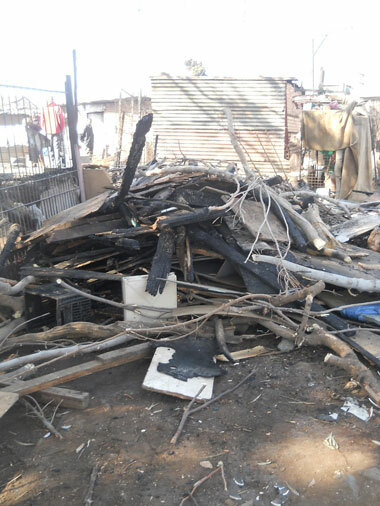 A fire on the morning of Saturday 18th August 2012 started in daylight, due to an unattended paraffin stove. Eldorado Fire Brigade attended the scene. The blaze left three old ladies homeless. Also seven young men aged 22 to 30 without shelter. Also an older man of 47 is now destitute. 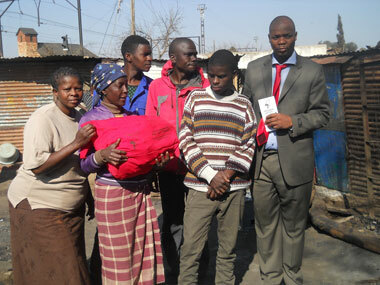 Also a woman of 45 has lost everything along with her school-going daughter Lerato aged 8. 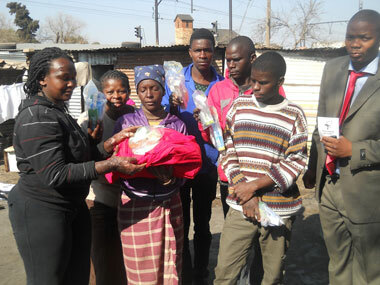 The ward councillor Pam Sibanyoni phoned Children of Fire for assistance. We set out there with a bed, two mattresses, two desks, a kitchen unit, two pillows each, two large blankets each, TUC biscuits, large containers of pasta, some tinned food, wash things for all, tin openers for all, bags of assorted clothes, cups, mugs, saucers, saucepans and some toys. 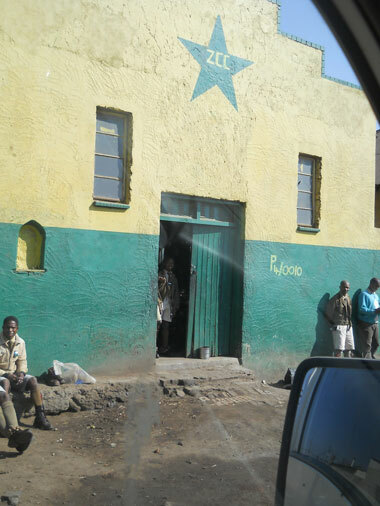 Items were stored in the ZCC church until the people can gather rebuilding materials and make new shacks to put their possessions in. Children ran around nearby, next to an unfenced railway line. Thanks to Louis Rutstein for transport and Amanda Simanga for helping with language and distribution. The poorest give the most. For 2000 years the widow's mite is the nature of humankind.